It is clear from the report that the costs increase according to income because of choices families make. 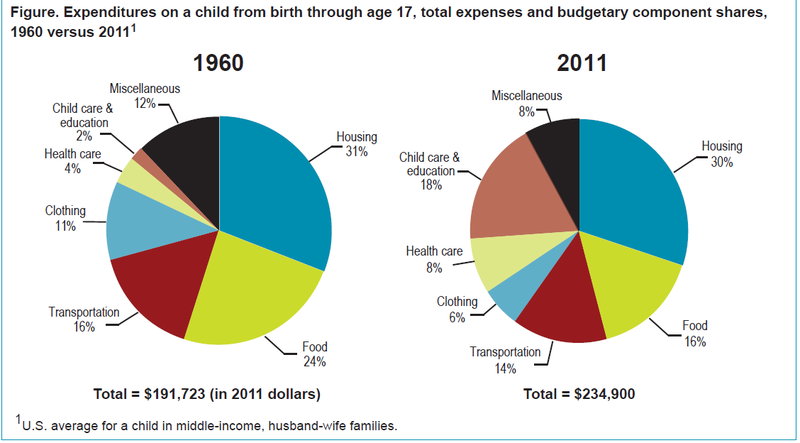 Thus, it is not quite accurate to say child-rearing gets more expensive with income. Instead, families tend to choose to spend more on their children the more income at their disposal. The price of attending the Illinois State Fair is skyrocketing again. This summer, it will cost $7 for adults to attend for a day, a 40% increase from last year’s $5 admission price. In 2009, prices increased from $3 to $5 in 2009 and broke a 19-year run at the $3 admission rate. It looks like Illinois is playing some bigtime catch-up. Children and senior citizens will pay an extra 50% at $3 per person. Redbox raises prices 20% to cover higher costs for DVDs and debit card transactions. Last week, Redbox, the company owned by Coinstar (CSTR) that rents movies through big red kiosks, raised the price of DVD rentals from $1.00 to $1.20, a 20% increase. The company needs to offset higher costs for DVDs and process debit card transactions. Redbox tested out higher prices for a year in select cities and concluded that it was OK to roll out the increases nationwide. Given this testing, the company should not suffer the same backlash and outcry that Netflix (NFLX) suffered when it dramatically increases its movie rental prices. In “Philips Warns On TV Business As Price Pressures Remain“, the Wall Street Journal reports that Philips (PHG) observed a 15% decline in television prices form the fourth quarter of last year to the first quarter of this year. PHG is under pressure to turn a profit in televisions as the company has lost money in this division for several years. Netflix (NFLX) is increasing the price it charges for its 1-DVD and 2-DVDs out at a time plans by $1. Its 3 DVDs-plan will increase by $3 to $19.99. Expect more upward pressure on the price of stamps to recover the ever-bleeding revenue streams at the Post Office.